I am moving along nicely here with my goal. I still think it is quite daunting, and unlikely to happen, but I can only try. The fifth book of my yearly endeavor is Shadows Linger, by Glen Cook. 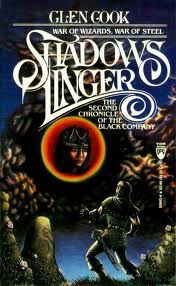 I read The Black Company 4 – 5 years ago, and now I wish I had picked up Shadows Linger a bit quicker. Shadows Linger, although a nice, light read in the fantasy genre. Shadows Linger read exactly what it is–a middle of the trilogy book. I started this book many years ago. When I picked this up to read it this last time, I noticed I had a bookmark in it, and I was well over half way done with it. I probably only needed to read another 100 pages or less. Why did I put it down? I am not sure. I have a vague remembrance of just not being involved with it then. Whatever the reason, I enjoyed this go around. However, as I said, this is a middle-of-a-trilogy book. Nothing is resolved, and our “heroes” are in worse shape than they were before. So, The White Rose is going to be read fairly soon. I wish I had discovered Glen Cook in the 80s when these came out. He would have been refreshing. I love fantasy. I do. It is my favorite genre, but most books have the same plot: world is dying, motley crew assembles, go get something, kill the bad guy. Which I am fine with, but it is nice to see fantasy authors like Gemmel, Feist, Martin, Erikson, and many others now, that just have stories set in a fantasy world with no questing–sword and sorcery as some would say as opposed to epic fantasy. And lastly, I must say, look above. That cover art is hideous. It really is. This entry was posted in Reading and tagged black company, fantasy, glen cook, military fantasy, reading. Bookmark the permalink.